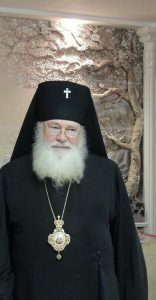 Nativity Epistle of Most Reverend Tikhon, Archbishop of Omsk and Siberia, 2018. Nativity Epistle to all faithful of the Russian True Orthodox Church in the Russia and in the Diaspora. Dear Archpastors, most reverent shepherds, diligent monks, and God-loving flock of the Russian True Orthodox Church! I congratulate you all on the Nativity of our Lord God Jesus Christ! St. John the Theologian says in his Gospel: “For the life was manifested, and we have seen it, and bear witness, and shew unto you that eternal life, which was with the Father and was manifested unto us” (John I, 2). What is this new life, and why is it so desirable for people? Why is the Apostle John in a hurry to rejoice with the listeners and readers of his epistle, assuring them that there was a new life in an Incarnate Savior? Indeed, the Incarnate Savior brought a new life and called Himself the life of all. And those who took His life unto themselves, for First of all, His very Christmas. – That transformation of the soul and human life, which He performed by Himself, was reflected with all clarity in the city of Bethlehem. This small city these days reflected the whole world, and the events of the Nativity of Christ reflected the whole life of the entire human race. Now Bethlehem is the true image of the sky, not the one that adorns the stars and illuminates the rays of the sun, but the one that the choirs of the angels announce with their singing. And where the eternal Sun of truth shines — Christ our God. There were many then in Bethlehem, the nobles, the wealthy and the unoccupied. But no angel appeared to them, heralding the birth of the Eternal. Not they, but the poor people deprived of a night’s sleep, were granted a heavenly vision; they taught the whole human race to chant those blessed words that were heard in heaven: “Glory to God in the highest, and on earth peace, good will toward men.” (Luke 2, 14). They, the first after those who had given birth to the Substantial, were honored to behold Him and worship Him and glorify the Most Pure Mother of the Lamb and the Shepherd. Today, again, our thought is unwittingly carried away to the unknown at that time, the city of Bethlehem, and not to Bethlehem itself, but to the shepherd’s cave, to this rock of the rock, where the Newborn Infant God lies in the shroud of the manger. All promises fulfilled. Here, from the den shone the Light of Reason; the Sun of Truth appeared. The people sitting in the darkness and the shadow of death saw the great light, the heavenly light lit up the darkness beyond the light. This Light, which came to the world, hid in the eyes of the servant of the Son of Man, shone as the light of the One Son of God: when the Savior was humbled, His glory was revealed as the Son of God; this light is beginning to shine now. This light also shone on the Jordan at the time of baptism, when the voice of God the Father was heard and the Holy Spirit in the form of a dove descended upon Jesus. This Divine light shone in miracles, in teaching, and in the manifestation of God’s power; shone on Tabor during the Transfiguration, when the Face of Jesus shone like the sun and the clothes were white as snow. This light did not disappear even on Calvary when the material light – the sun – was dim, and the moon did not give light. Finally, shone from the Mount of Olives at the Ascension of the Lord and in the Upper Room of Zion at the descent of the Spirit in the form of tongues of fire. Why then did the Lord come to earth? The answer is one – in order to save a person. If the Lord accomplished this work for a person, then it must be recognized that a person is of some special value, because for the sake of an insignificant unworthy thing, there would be no such means of salvation accepted. Even the king and the prophet David, 1000 BC, exclaimed in perplexity: “Lord, what is man, that thou art mindful of him? And the son of man, that thou visitest him? For thou hast made him a little lower than the angels.” What is a man? This is what the Word of God says about it: man is the best creation of God. Man is the image of God. “And the Lord God formed man of the dust of the ground, and breathed into his nostrils the breath of life, and man became a living soul.” The Lord in a special act, created a man – first the body, and then breathed into him the “breath of life”, that is, put into it a part of His Divine Being. Having accepted the flesh of man, the Lord clothed Himself with glory, higher than the glory of Adam in heaven before the fall. If we are truly Christians, if we force ourselves to do in practice what the Lord Jesus Christ came for us taught, then we will be where the Lord is, as He promised in parting with the disciples. Those who have been granted the kingdom of God will be enlightened like the sun, says the Lord. On this day, I want to fall beside the manger of a newborn God-child and say out of compassion: “Lord, why such endless and painful self-deprecation and suffering, when people themselves are guilty and have to be punished?” But, “the mystery of piety is mystery”. Silence. Christ himself, born of the Virgin closes our lips: “we must fulfill all righteousness,” He says to His Forerunner. “For I came down from heaven, not to do mine own will, but the will of him that sent me.” “Get thee behind me, Satan”, He tells the Apostle Peter, who keeps Him from the path of the cross, “thou art an offense unto me: for thou savourest not the things that be of God, but those that be of men.” (Matt. 16.23). The sun of truth has shone mercy. Great joy is proclaimed to all people by the condescension of the Savior. The brought light of Christ should shine in our hearts and in our deeds. “Let your light so shine before men, that they may see your good works, and glorify your Father which is in heaven.” (Matt. 5, 16). The fight between light and darkness continues to this day: outside and in our souls; and “And the light shineth in darkness; and the darkness comprehended it not.” Let us leave the matter dark and clothe ourselves in the experience of light. There is no communion between light and darkness — between Christ and Belial. Let us walk like children of light, kindling their flickering or fading lights from the gracious light of Christ that has arisen, so that we with joy, as wise virgins, meet the bridegroom. Let us glorify the revealing Lord, rejoice in His Nativity! Nothing will take away this joy from us – neither poverty, nor resentment, nor the labors of the day: He blessed all things, and magnified and sanctified Himself in the city of Bethlehem. The light of Christ enlightens all. Glory to Thee, who hath shown us the Light! Merry Christmas to all the children of the True Church of Christ, with all my heart I congratulate you! Christ is born, glorify him!